It’s great too see how this Project evolve over time. Or maybe an extension/something similar can be made for CCV 1.3 that automatically loads the MTV drivers? Or, they could just be built in. Again, this is coming from someone who knows almost next to nothing about programming. Is anybody else having problems running this? When I try to run this I get this error. Do you have VS2008 SP1 redist installed on your machine? This will be helpful to us that we run Windows 7/Vista. I don’t know if this implementation can happen BUT think of the other guys that run Linux, OSX etc. This addon will not help them in their setups. From the other side, CCV and MTV are totally different things. Why should be together? Looks good! can´t wait to get home and do some testing! Thanks! I have the same problem with that popup box error. I have the latest version of visual studio but no version of 1.3 will work for me. 1.2 works fine. It’s so great! Can’t waite to test it! thx! 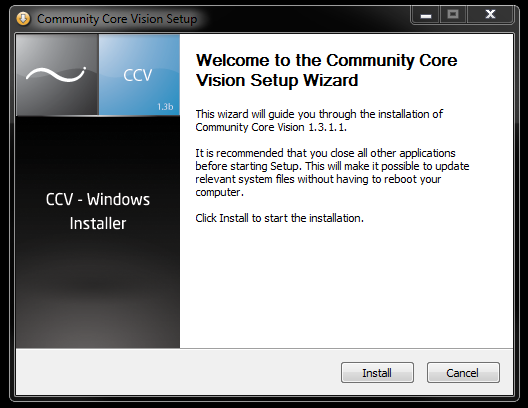 Well, I guess I’m thinking that there’s a large crowd out there who use CCV for the sole purpose of getting multi touch to work on Windows Vista/7 (rather, I’d say that crowd is growing rapidly and will continue to grow rapidly in the near future), so why not make it as easy as possibly to use features and software that already exists? If we as a community can offer a software which makes your Windows 7 computer multi-touch, we can only grow and diversify from there in terms of specialty software and UI’s. Hate to be that guy, but when will OSX/Linux versions (in binary form) be available?